Favored Santiago de Cuba is in the tough position, the team must win four of five games to make it to the Eastern Division semifinals of the Cuban Baseball Playoffs. The defending champions lost at home to Villa Clara by a score of 8-3 on Thursday and then 3-1 on Friday. Thursday’s game saw Villa Clara jump on Santiago veteran ace Norge Luis Vera for 10 hits and five earned runs in 4.1 innings. Freddy A. Alvarez got the win going 6.1 innings allowing three runs on seven hits against the fearsome Santiago lineup. The score was tied 3-3 after three innings but Villa Clara chipped away scoring in the fourth, fifth, eight and ninth innings while Santiago was held in check. In all, the winners had 15 hits to Santiago’s 11. Villa Clara’s lead off hitter Leonys Martin (CF) contributed a homer and two RBIs going 3-for-5 and second batter Aledmis Diaz (SS) had two his including a solo homer. Hector Olivera (2b) was Santiago’s bright spot managing tree hits including a double and two RBIs. Friday’s game was more of a pitching duel between starters Alain Sanchez (VC) and Santiago’s Danny Betancourt, with great relief pitching on both sides. In getting the win Sanchez allowed one run on six hits, struck out five and walked one in 6.0 innings. Betancourt, the loser, made one costly mistake, when in the third inning when Ariel Borrero (1B) blasted a three-run homer, accounting for all his team’s scoring. Besides that, Betancourt allowed only three other hits and struck out four while walking two. Bullpen workhorse Yolexis Ulacia, who went two scoreless innings on Thursday, picked up the save on Friday for Villa Clara with 2.2 innings of hitless pitching. Using his sidearm style he came on to put out the fire in the seventh inning when Santiago had put together three consecutive hits for a run and threatened more. Ciego de Avila won a tough pitching duel 2-1 on Thursday over Holguin and the Cuban World Baseball Classic star lefthander Aroldis Chapman. On Friday the team had an 8-6 lead in the bottom of the fourth with the bases loaded when the sky opened up and the game was suspended. The game will be continued at 5:00 p.m. on Saturday, weather permitting. Thursday’s game was a classic for pitching lovers between Ciego’s Maikel Folch and Holguin’s Chapman, with only nine hits between the two rivals. A costly error proved the difference when in the sixth Ciego managed its only two runs. Lefthander Maikel Folch had stellar control throughout using only 63 pitches until he gave up a solo homer to Yoanis Quintanta with two out in the eighth and the league’s leading closer Vladimir Garcia was brought in to save his 26th game of the season. Chapman also had excellent control (10 strike outs) and his fastball was clocked at 100 MPH. However in the sixth inning, Yordanis Perez managed one of Ciego’s six hits followed by pinch hitter Mario Vega receiving a 99 MPH fastball on his left forearm to put two on. Chapman then gave up a liner to center by Adonis Garcia driving in the deciding runs. The Ciego defense played an important role in the win with the inflied managing to turn three double plays. World Baseball Classic pitchers Pedro Luiz Lazo (7.0 innings) and Yunieski Maya combined for the opening victory over Sancti Spiritus top starter Ismel Jimenez (who also pitched in the March WBC). In that game Pinar centerfielder Mijain Rivera had a three run homer to lead his team. On Thursday, Pinar starter Vladimir Baños had relief help from Yosvani Torres (who got the win) and Raudel Lazo. Sancti Spiritus’ Angel Peña was ineffective in game two allowing five hits and three runs in 2.1 innings, followed by Yoen Socarras who fared even worse giving up four runs on six hits in 2.2 innings. The game was 5-0 before Sancti Spiritus got on the scoreboard with three runs in the fifth. However, the closer game didn’t last long with Pinar coming back with three in the bottom of the sixth. In all, Pinar had 15 hits including homers from Osniel Madera (DH), Rafael Valdes (2B), Yosvani Peraza (C), Norlis Concepcion (1B) and Raidel Hernandez (RF). Sancti Spiritus almost matched with 14 hits, including a double from Orlando Acebey, and two RBIs each from Yunier Mendoza (1B) and Eriel Sanchez (C). Frederich Cepeda (LF), managed three hits but didn’t drive in or score a run. Habana Province, the team that led the Western Division this season practically from start to finísh now has Isla de la Juventud in the difficult position, like Santiago, of having to win four of five games to move on to the semifinals. The 8-7 and 2-0 wins by Habana weren’t easy but it’s the final score that counts. In game one, Habana scored two in the eighth and two more in the bottom of the ninth for a walk off win in a game that saw Habana’s league leader in ERA, Yadier Pedroso, tagged for an unusual six runs in 4.1 innings. It was eventually closer Miguel Lahera that got the win by pitching the ninth inning when Habana rallied. 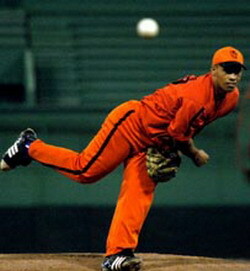 In game two Yulieski Gonzalez pitched a complete game shutout scattering seven hits. It was a tough loss for Isla’s Wilber Perez who allowed just two runs, one earned, while striking out nine and allowing six hits over seven innings. In a game without home runs, Daynier Galvez (SS), Rolexis Molina (LF) and Vladimir Garcia (RF) had doubles for the losers. Ernosto Molinet and Juan Carlos Linares drove in the games only runs for Habana. On Saturday Pinar del Rio and Sancti Spiritus face off in their game three as do Habana and Isla de la Juventud. The suspended game between Ciego de Avila and Holguin will also be resumed where it left off.